We have discussed infrastructure services – services that are intended for developers, not end users. Amazon jumped off to a lead in this space, and many Web sites now use their virtual machines and storage services. They appreciate not having to invest in servers and the easy scalability of these services. The cost is also low because Amazon enjoys economies of scale and expertise in building and reliably running huge data centers. Amazon has recently cut prices for their infrastructure services, added a service level agreement, and support for Microsoft .NET and SQL server. (They initially focused on Linux). These moves are designed to appeal to enterprise developers. In focusing on enterprise developers, Amazon is in direct competition with Microsoft. Microsoft will be announcing their entry in this market soon. Rackspace, a large hosting firm, offers similar support for both .NET and Linux. They call it “Mosso,” which means fast in Greek, and claim that you can get started in only 8 minutes. Web and enterprise developers will need to be able to use these infrastructure services in the future. Would you like to learn to deploy applications in the "cloud?" We discuss people's motivation to contribute time and content, and speculate on the total value of contributed content, the "gross contributed product." In a recent report, the Linux Foundation, estimates that it would cost approximately $10.8 billion to build the Linux community distribution Fedora 9 in today’s dollars with today’s software development costs. The market research firm IDC reports that hardware and software spending related to Linux hit $21 billion during 2007, and predicts that it will rise to $48 billion by 2011. To put the size of the Linux market in perspective, we note that in the year 2007, the GDP of the State of Maine was $48.1 billion, and the GDP of 7 states was less. How many people would you estimate are employed in Linux-related industries? Most of you use or will be using Visio to create diagrams. I just came across Dabbleboard, a vector drawing service you might find useful. It is not as capable and flexible as Visio, but it is very easy to use, extensible -- you can reuse shapes and shape libraries you and others create -- and, of course, it is a networked application. Several people can work on the same drawing at the same time, and the drawing can be made public or shared within a limited group when it is published. You can create libraries based on your drawings, and there are also public libraries and tool kits. If it sounds interesting, check this how-to screencast. Dabbleboard has several features that facilitate and encourage collaborative work. What features would you like to see them add? What do you think the community of Dabbleboard users will add? When would you use Dabbleboard instead of Visio? When would you use Visio? The Internet facilitates collaboration, which is often voluntary. We discuss non-economic motivations for contributing time and effort to projects as well as the social and economic value of those contributions. Jon Postel who died ten years ago today, led the development of critical Internet organizations and technologies without the economic incentive of an entrepreneur. You can read about his contributions here. How was Jon Postel "paid" for his work? What was its value to society and the economy? Have you made any unpaid contributions -- perhaps "digging" a blog post, reviewing a product or book, or making an improvement to a Wikipedia page? We discuss the falling costs of content creation, publication, and distribution. Commoncraft has built a successful educational video business by taking advantage of these falling costs. Commoncraft is a two-person (husband and wife) company, and they want to remain small. Low resolution copies of their videos are available for non-commercial use at no cost, and they license high resolution versions for commercial use. 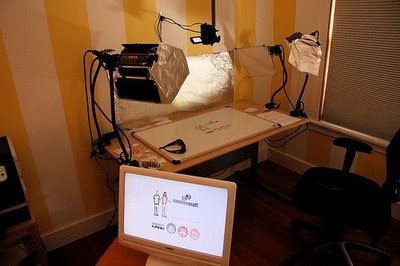 As shown here, they have a very low-tech studio, keeping their investment low. Their time is the only significant cost of producing a video. Distribution cost is also nearly zero. The non-commercial version of a video is distributed at no cost on YouTube and other video sites. They distribute the commercial version from their own server at minimal cost. Marketing also costs close to nothing. They post a video on Youtube, and wait for users to find it and tell each other about it. They do "viral" marketing. If it were not for the Internet, what would it cost to produce, market and distribute short educational videos? Since the cost of entry is so low, a Commoncraft competitor could easily spring up. (They even have a Web page showing how they make their videos). Would Commoncraft have an advantage over a competitor? Would they mind the competition? Several people ran benchmarks when Google Chrome came out, and concluded that it was faster than Internet Explorer and Firefox. But others, for example this article on 10 things to love (and hate) about Google Chrome, found Chrome to be no faster. Relative speed depends upon the benchmark. I created a Google Spreadsheet that computes 200 sines, cosines, squares and square roots. Recalculation was noticeably slower with Chrome (23 seconds) than Firefox (2 seconds) or Internet Explorer (10 seconds). The bad news for Google is that they will have to improve the efficiency of their math libraries. The good news is that Firefox has demonstrated that it can be done. More good news -- the user will not have to install new software when it is ready. It will automatically download when the application is used. The bad news for Microsoft is that they too will have to improve the speed of math calculations in Internet Explorer. That will not be difficult for them to do, but doing so will have a bad-news side effect -- it will narrow the speed gap between Excel and Google Spreadsheet. This is just one example. Microsoft will be forced to improve Internet Explorer to keep up with Google, Firefox and others. But every time they improve Internet Explorer, they chip away at the advantage their dedicated Office applications have over the network applications of Google and others. The performance gap between desktop and network-based programs narrows. Can you think of other new technologies that painted an old technology into a corner? If you were running Microsoft, how would you deal with this situation?